Yes, that's the one. Or maybe it's M61? What on earth have you been on this time? Nothing at all - honest! Whatever you call it, this little motorway takes a front seat in the 1950s motorway schemes. Why do you refer to it as two numbers? Well, as How the Motorways Were Numbered relates, there were two competing systems for motorway numbering when the network was first under construction, under the "winning" scheme, this motorway went by the name of M61. In the "losing" scheme, M17. The odd thing is that M17 is seemingly still used to refer to this motorway even when the numbering system was finalised, despite it being "wrong"! I see. So where was it then? It's the Castle Donington Bypass, in Leicestershire. 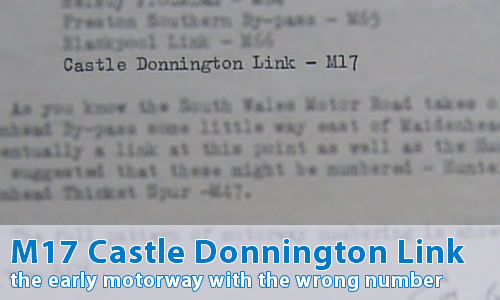 It sometimes went by the gloriously snappy title of "Link Road from Near Castle Donington to London - Yorkshire Motorway", and more often than not, the Ministry don't appear to be able to spell "Castle Donington", adding an extra "n"! It would have met the M1 at junction 24, and oddly enough the original junction design (a copy of which is held in Leicestershire County Archives) shows the roundabout as in situ today, but with the unconstructed M17 link shown, leaving a nice space - which was utilised many years later when the new section of A453 was plugged into the southwesten corner of the roundabout. Oddly enough, that roundabout's also home to the unbuilt A6 Kegworth Bypass, but that's another story entirely. The route itself would have passed to the north of East Midlands Airport (or Nottingham Leicester Derby Sheffield Manchester New York Antarctica Airport, or whatever it's called this week), and ended roughly in the location of the roundabout on Hill Top (or the old A453), immediately to the north of the western end of the Airport runway, if that makes sense. There would have been no intermediate junctions. No, I suppose not - there's not a lot between the two ends. Indeed not. It would have been a motorway linking nothing but a pair of non-motorway roundabouts - pretty much like Northern Ireland's A8(M). All in all, a bit of a pointless use of motorway restrictions. Anyway, you can see a map of the route here. What happened to the proposal? Well, really it wasn't exactly top priority - a short motorway bypassing a relatively obscure small town in Leicestershire. The proposal sat in the bottom drawer at the Ministry, until the late 1960s, when extending the motorway network was considered. It was killed off quite firmly by other proposed motorways in the area - first the M64, and then when that went the way of the dodo, Castle Donington was eventually bypassed on a more southerly line by the A42.